When Tata officially revealed the dimensions of Tata Harrier it was one of the widest and largest of the competitors. Not only it is longer than the competition, but it also carries a wider stance. 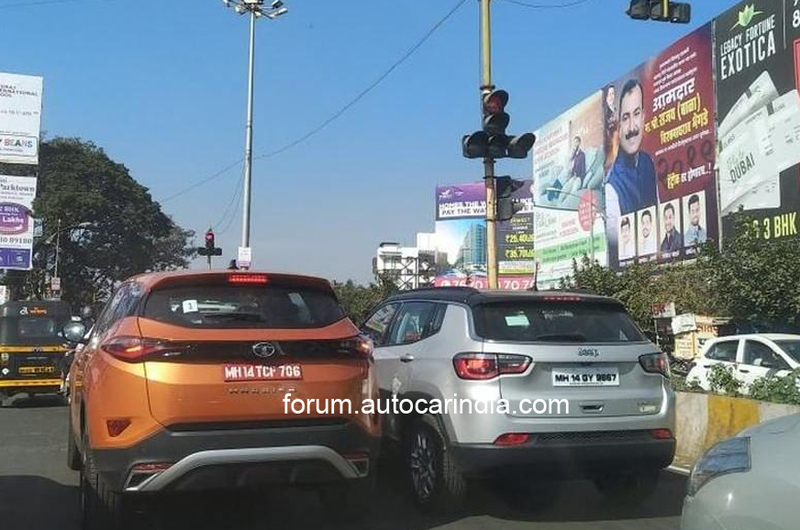 Now we have come through some spy pictures of Tata Harrier standing next to a Jeep Compass on the street. The picture has been shared on Autocar India forum. We can clearly see that the Harrier looks much bigger and has better street presence of the two. The Tata Harrier looks much taller too as compared to the Jeep Compass. Coming to the dimensions Tata Harrier is 4,598mm long, 1,714mm tall and 1,894 mm wide. Wheelbase is 2,741mm. Jeep Compass in comparison is shorter in every dimension measuring 4,395mm in length, 1,818mm in width and height of 1,640mm. Wheelbase is 2,636mm. Build on the OMEGA platform of the Land Rover, Harrier will offer a great package. In the interior Harrier gets a floating touchscreen infotainment system with 8.8″ display and 320W JBL system with 4 speakers, 4 tweeters and 1 sub-woofer! and also an amplifier. On the safety front, it gets traction control, ABS, EBD, ESP, engine immobiliser, child lock, ISOFIX seat mount, Hill-hold and hill-descent control, roll-over mitigation, corner stability control and 6 Airbags. The Harrier gets 17inch alloy wheels 235/65 R17. Tata is offering Harrier with the 2.0-litre Multijet diesel engine which it calls as Kryotec 2.0. The Kryotec diesel engine produces 140 hp and 350Nm of torque mated to a 6-speed manual transmission. Jeep Compass also gets the same engine with a different state of tune offering a higher 170ps and 350Nm of torque. It comes in both 6-speed manual and automatic variant. Tata Harrier will launch next month on 23rd January and will rival against the segment’s leaders like Hyundai Creta, Mahindra XUV 5OO and Jeep Compass. It will be priced around 16-20 lakhs.